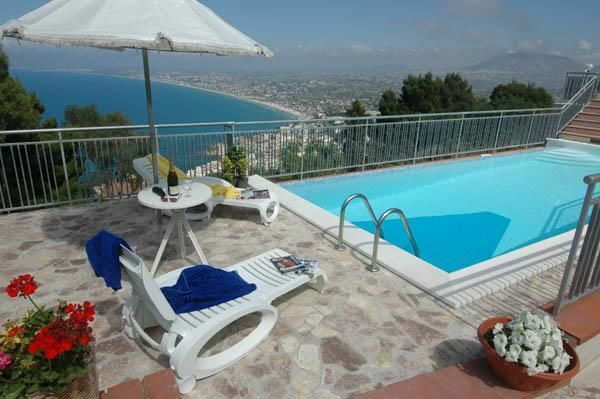 Beautiful villa set on different levels and situated in a quiet position. The villa is plunged among the green of the Mediterranean scrub, on the slopes of Monte Pizzo Teleffio, which dominates Castellammare del Golfo, with a panoramic view over Punta Raisi. The furniture is sober and consistent. Distances: the pretty village of Castellammare with all kinds of shops at approx. 2 km, Scopello at approx. 5 km, Zingaro Natural Reserve at approx. 7 km, Palermo airport at approx. 40 km, the beaches are at approx. 3 km. At guests’ disposal: well kept furnished garden, private swimming pool (4m x 8 m – maximum depth. 1,5 m – open from 01/05 to 30/09), barbecue. Parking within the grounds. Extra services: on request it is possible to reserve an extra twin-bedded room at the cost of € 200,- / per bed / per week. Ground floor: large living room with large windows and view over the sea, equipped kitchen (oven, freezer), 2 double bedrooms, double bedroom with fireplace and view over the sea, twin bedded room, 2 bathrooms with shower, bathroom with tub.